To continue with my notes on the songs on my 11th album, Sampler, we get to the 6th track. That title is called Very Confused. The description of how I did it may be as equally confusing. As inspiration for and as a way to try different ways of composing, I took an existing piece, the first movement of the Opus 2, No. 1 Beethoven Piano Sonata. I loaded a midi rendition of the piece into my DAW. I used a function that takes all the notes of the file and extracts them to separate MIDI tracks. I forget how many unique pitches there were, but it was a large number. Based on the visual look of each track in a piano roll editor I moved tracks around and combined many with specific percussion instruments in mind. I ended up with 16 different midi tracks. Using what I thought would sound good in combination with all the other tracks I assigned various percussion instruments to each of the 16 tracks. All the percussion sounds were from the Native Instruments sound library Percussion Symphony Series. Even the mysterious piano sound was from that library. Processing, as with much of my music was minimal, once the desired sounds were recorded. The Claves had Replika XT (from Native Instruments) on it with a special effect patch highly modified. The Rain Stick track utilized the Movement plugin (from Output.com), 11.8 pitcher from one of the expansion packs. The vibraslap track sounds like a metalic flying object with lots reverb. That was accomplished by sending it through the Dual Crystals effects chain in Absynth. I used a little bit of EQ and compression here and there. The original Beethoven Sonata movement, with repeats is nearly 20 minutes long, far too long for a track on the album. So I cut and chopped different sections, mainly silence and shortened it to less than 6 minutes. I was surprised by how much silence there was in the original piece when broken into its individual notes. It is definitely Very Confused. I hope you like it. If you do or have any other comments or questions, please leave them below. In case you did not know it, SheetMusicPlus.com has been operating a self-publishing platform similar to the way Amazon allows book authors to publish material for their Kindle. I’ve been using it since Jan 2016 to sell all the titles I have available and have been quite happy with it. (I also should add that SMP is my go to source for printed music since there are no music stores within driving distance of where I live). 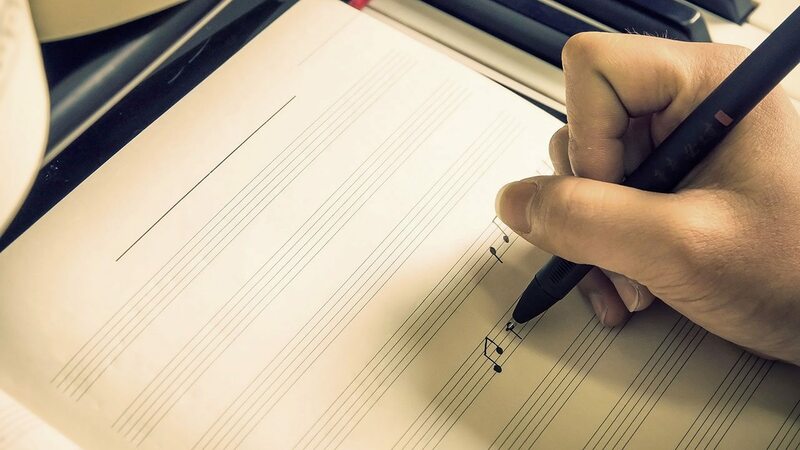 The following article explains it much better than I can and includes some videos to help Sibelius users although anyone who can create a PDF file of their music can participate. Their ArrangeMe option, discussed in the article is a great opportunity for arrangers. In addition to Sheet Music Plus, ScoreExchange.com out of England also allows you to sell your music for free. They are very geared toward Sibelius users, allowing them to upload Sibelius files directly to them. I also have many of my titles there, but unfortunately, they are not as well known as SMP. JW Pepper music in the USA has a publish option for composers/arrangers that has a startup fee but also makes titles available to customers in printed form and is geared toward the educational market. I’ve not tried them. Are there any other similar services I didn’t mention? Any pros/cons anyone would care to discuss? Please comment. Back in 2014 I did a tutorial video on YouTube titles How to play a Leadsheet on solo piano. A followup to it is below. The video pretty much tells all you need to know to get started playing a leadsheet. One correction is that the D7/F chord on the first line should be a D7/F#. The following description and addition may help in learning to play a leadsheet. The 2nd sheet music simply shows the block chord with all the notes we could use to harmonize the leadsheet. It is mainly for illustrative purposes. I would never play a leadsheet with just root position block chords. The final example is the most like one might play. The examples, with the harmony spread between both hands and with rhythmic variation show various rhythmic possibilities for the accompaniment/harmony. However, there’s too much rhythmic variation going on. The last two lines could be played “as is” but the first two lines have, because it is illustrative and not practical, a variety of rhythmic styles. The next step in leadsheet playing is to listen or look at sheet music of various styles of music similar to the one you are learning. Try and use the rhythmic patterns and harmonic voicing in those examples in your own playing. Leadsheets, after all, are not meant to be a final arrangement. They are there to remind you of how the piece goes and give you just enough information so you can play it such that a listener is reminded of the song. This is just a starting point to playing from leadsheets. Bonus points if you recognize what the featured photo shows (besides a leadsheet). Sorry it’s been since March (nearly 6 months) since I’ve last posted. As mentioned in the last post, I’ve been doing custom arrangements for a client that’s reached about 10 titles. Plus I’ve been working on series called “Any Size Church Orchestra series” of arrangements for church groups that never know from week to week who will be there. These arrangements, now available at my website, are playable by a wide combination of instruments. But, today I want to feature my Concert Band arrangements. I will let the demo videos speak for themselves. (Please remember, these are demos from computer software and not mixed. I have neither the time to mix them nor money to hire a real band). PS. If you’re in the Gainesville, Ocala area on October 16, 2016 I’m giving a solo piano concert featuring TV & Film music. It is at 2pm at the Church of the Mediator in Micanopy, FL. I know I’ve been a bit behind in regular posts here and on my YouTube channel. I probably use Twitter more than anything so if you want to know the latest, follow me there. (@MusicbyJames). As mentioned in my last post, I’ve been arranging some copyrighted material for distribution via SheetMusicPlus. I have some new titles available including “Crazy”, “Hawaii Five-O Theme”, “A Nightingale Sang in Berkeley Square” and “Fly Me To The Moon.” Mostly for solo piano but also a string quartet. Visit my SheetMusicPlus page to see all I have available. I recently finished a custom instrumental arrangement for a church group in the Houston, TX area. The group consists of ages 11-18 with a few adults. This makes a total of four I’ve done for them. They’ve all been well received. I’m available to arrange or compose anything for any combination of instruments or styles. Drop me a note if interested. Here’s a video of the group playing my first arrangement. Remember, they are beginners. I continue to provide MIDI files for a Lutheran church to use in their services. I send the files over the internet. They hook their computer up to the organ, select the registration they want, hit play and that’s their accompaniment to congregational singing and also some background music during communion. Any midi capable instrument (piano, synthesizer or organ) can be used to play the files. Of course, I’m still teaching piano lessons locally. I can also teach via Skype if you aren’t in the area. Being a church musician is a great way to have a steady gig as a musician. The small, rural parish church I play for had to give up its choir last November due to only 3 or 4 people (all inexperienced, non-musicians) showing up. But for Easter and weeks leading up to it we had some soloists sing in addition to some extra material from me. I offer consultation on how to make the most of your church music program and/or help in accompanying congregational singing – from a single pianist up to a large praise band or orchestra. Is there anything in the way of tutorials or general information you’d like to see here on this page or my YouTube page. Updated Dec 2015. The point in the northeast of Greenland represents all the sales where people did not give their location. Here’s a map showing where in the world my sheet music has been purchased via my distributor SheetMusicPlus.com. It only covers from March 2014 – October 2015. I plan to update it a few times a year. Thanks for those that attended the movie & TV themed concert I did on Oct 25, 2015. The audience request section was more popular than I thought it would be. I got stumped on a couple of requests I didn’t know.This might become a regular/annual part of our concert series. I was able to “stump the audience” a few times with a few pieces nobody could guess. Prizes were handed out to those who could guess the hard ones. In addition to the audience participation sections I played a variety of TV and movie music spanning the years from Casablanca up to more current titles.